I confess to feeling a little smugger than usual this August, as I’ve managed to read several Viragos – more than I normally manage, as there are so many bookish distractions around. Particularly pleasing is that this book is a large (over 500 pages!) and epic tale by Edith Wharton, who I haven’t read enough of – and I absolutely loved it! I read it while I was on my travels, visiting my mum and my offspring, and it was the perfect companion for train journeys and reading whilst away. “Hudson River Bracketed” (the titled refers to a style of architecture) was published in 1929, and it tells the story of Vance Weston. Born in the American mid-west, the son of a successful real estate developer, Vance is used to a modern, comfortable, forward-looking life. The family have gradually moved upmarket, from smaller houses to larger, even more modern ones and Vance has had a college education. But instead of taking the obvious course and going into the family business, he wants something different; some of the spark of his grandmother is in him, something that sees more in the world than just the quotidian, and Vance wants to be a writer. After an illness, he leaves the family home in the town of Euphoria and goes to board with a distant cousin, Mrs. Tracy, who has a ramshackle house in Paul’s Landing, up the Hudson River from New York. Basing himself here, he plans to make an assault on the Big Apple and make it as an author. However, the culture shock he experiences when he arrives on the Hudson is immense; for the first time in his life he comes across a way of life unlike his, with long roots to early American settlers. And the sight of his first old house has a dramatic effect on Vance, so much so that it changes his course mid-stream. As they left the house he realized that, instead of seizing the opportunity to explore every nook of it, he had sat all the afternoon in one room, and merely dreamed of what he might have seen in the others. But that was always his way: the least little fragment of fact was enough for him to transform into a palace of dreamss, whereas if he tried to grasp more of it at a time it remained on his hands as so much unusable reality. The Tracy family are related to the Spear family (I could have done with a family tree here) but the latter are of a different class. Cultured and refined, their only contact with the Tracys is to employ them to clean and keep an eye on The Willows, an old house owned by a cousin in the Lorburn branch of the family. Whilst helping his cousins Laura Lou and Upton, Vance stumbles on the library and it is here that his real education begins. A college education has not prepared him for the splendours of classic literature; neither is he prepared for his meeting with Heloise “Halo” Spear, another distant cousin who will become his muse and obsession, as well as guiding him through the books at The Willows..
“Hudson River Bracketed” could really be subtitled “A Portrait of the Artist as a Young Man” because that’s most definitely what it is; and how unusual to have that portrait painted by a female author! Vance is a remarkable creation – complex, nuanced and perhaps more finely drawn than might be the case by a male writer. Interestingly, in the afterword by Marilyn French, the latter states that she regards the book as flawed because of the fact that Vance, as hero, is flawed, which I personally found an odd judgement. Vance is certainly no perfect hero – he has talent, but he’s weak, and his compassion and need for companionship overtake any logical thinking at times in the story. His treatment of women is often unthinking, but he’s driven by the need to write and struggles to do this while he’s burdened with a wife who has no comprehension of his needs and also has no money to support her. HRB is a long book yet immensely readable, and beautifully written. There are vivid scenes of Vance and Halo watching a sunrise over the Hudson River; Vance and Laura Lou exploring in the snow; the countryside around The Willows and the house itself; and all of these are stunning and memorable, as were the characters. In particular, the troubled and intelligent Halo Spear is a wonderful creation. Married to a man she doesn’t love because of the fact that her family owe him money, she struggles to maintain an intellectual life and sees the genius in Vance Weston. Trying to help him draw this out, she becomes his muse and eventually the pair fall in love. This is always handled sensitively and convincingly by Wharton, and though they can’t be together out of loyalty to their spouses, I couldn’t help wishing they were as Halo seemed to be the only person able to help Vance attain his potential. Goodbye, July – and August reading plans! I’m really not sorry to see the back of July – it was a long and busy month, and I spent a lot of it reading one book, Dostoevsky’s “The Adolescent” (the review for which will be appearing in the next Shiny New Books). It wouldn’t normally take me so long to read 600 pages, but I *was* busy and I *was* tired! The minute I finished work for the summer, I raced through the rest of the book….! So, with July out of the way, do I have plans for August? Well, yes – there are a number of challenges up this month and I’d like to take part if I can. First of all there’s All Virago/All August, which the LibraryThing Virago group organise. I never go for reading nothing but Viragos for the month, because I would fail – like Jane at Beyond Eden Rock, I prefer the approach of “Very Virago/All August” and just read the ones that fall in with my mood. This month, I hope to catch up with the Dorothy Richardsons I’m behind on, and also read a large and interesting-looking Edith Wharton, “Hudson River Bracketed”. I’d also like to keep up the impetus with the Penguin Modern Poets project; the next one is volume 6 and it features two poets I know of (and at least one I’ve read) so it should be an interesting experience. August is also Women in Translation month. Goodness knows I have a ton of books by translated women, but choosing will be hard! There are two lovely Irmgard Keun titles lurking on the shelves so I may pick one of them. There’s also “Grand Hotel” which I’m doing for Shiny. Plus I may well re-read my favourite Colette, “Break of Day”, as I picked up the Capuchin edition in a charity shop! Last, but most definitely not least, I want to dip into HeavenAli’s #Woolfalong; the current phase is biography of all sorts and I’m considering “Orlando” or possibly “Recollections of Virginia Woolf”. Knowing me, I may end up reading neither of these, but I do want to read something Woolfish soon! And it was all going *so* well….. I have perfectly good reasons for all of them: “Kolymsky Heights” has been on the wishlist since it came out and couldn’t be turned down for 75p; the rather frail Wharton is a Virago I’ve never seen before so it was a no-brainer; the British Library edition of “The Hog’s Back Mystery” is in perfect condition for £1.75; the Stephen Spender I’d never heard of, but sounded fab; likewise the Mary McCarthy – I have several of hers and I really need to get reading her! Yesterday was Mothering Sunday in the UK, and I was rather spoiled I must say (even though all three offspring were away – two local ones visiting Middle Child in Leicester). They left gifts and instructions with Other Half and so I was treated to breakfast in bed and pressies anyway! Lovely new (old) green Viragos! 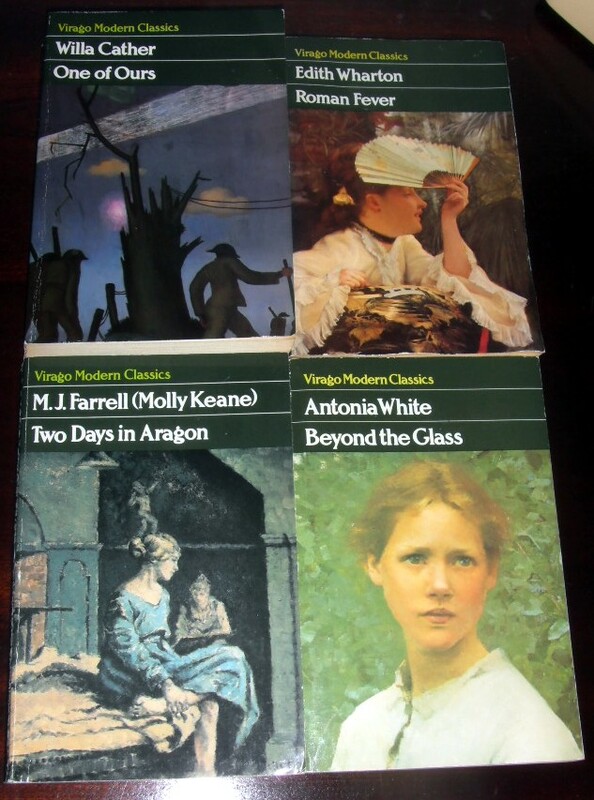 I was chuffed to say the least – the Willa Cather sounds fascinating; I’ve always wanted to read “Roman Fever”; the Molly Keane is one I don’t have; and I’m trying to get the set of Antonia Whites so this helps a lot!